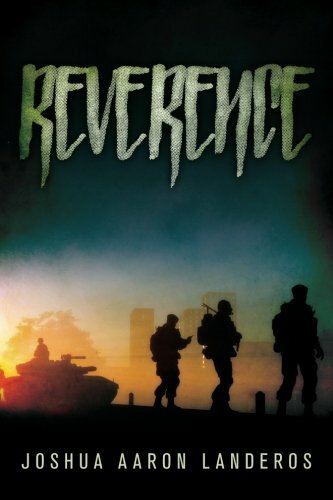 Article first published as Interview: Joshua Landeros, Author of ‘Reverence’ on Blogcritics. He comes from a large family in which he is admittedly "the black sheep." Landeros grew up on Dragon Ball Z, Godzilla films, Batman the Animated Series, and Star Wars. Not to mention an infinite love for dinosaurs and all movie monsters. He began writing in middle school starting with Godzilla fanfictions. He kept writing and eventually created his own world full of characters. In 2016, the dream was finally realized in his first novel, Reverence. He now attends University of California, Riverside where he majors in History Admin Studies and minors in English. Sheri: Welcome, Josh and thank you for being with us today. Why don’t you start by telling our readers a bit about yourself? Josh: Well, I’m a 90s kid as they once used to say, born in April 1992. I’ve lived most of my life in Perris, California, which is a hot and barren little town in Southern California. I was an odd kid in school, namely that while most kids were gossiping or playing sports, I was drawing dinosaurs and reading. In my math class, I would often be reading my dinosaur encyclopedia, to the chastising of my teacher. My love of reading and watching various TV shows/movies was probably my defining trait in school and to this day. I graduated high school in 2010 and attended community college in Moreno Valley, CA. It was my original intention to major in film, but problems with money in my single-parent home forced me to do solely full-time work for a few years. Luckily, after time things stabilized and I came back to school and even managed finally, to transfer to a university, one of the proudest moments in my life. Even after all that, old habits die-hard. During most of my classes I still end up reading novels or comics, depending on whatever my latest purchase has been. Nowadays I have a new habit during class: jotting down ideas for my planned series. Sheri: What is Reverence about? Josh: Reverence at its core is about William Marconi, a super soldier who, for many decades, has held up the superpower known as the United Nation Republic. The tyrannical government rules unopposed, that is until a new terrorist group emerges to challenge Chancellor Venloran. Will and his fellow soldiers are tasked with putting down the rebellion, but as the fight goes on Will learns the empire he’s been holding up may be keeping secrets from him. The super soldier becomes trapped between two choices: remain loyal to his Chancellor, or trust the words of the dangerous dissidents. Sheri: What was your inspiration for writing this book? Josh: A number of things really, but some of the major points off the top of my head would be the films Children of Men, V for Vendetta, and Blade Runner. Not only are these fantastic films, but they all comment on different aspects of society, which I definitely wanted to do in my work. As for the character of Will Marconi himself, I drew the biggest influence from Alucard of the Hellsing series and Roland from King's The Dark Tower series. Both are anti-heroes that do unsavory things to get what they want, and yet at the same time the audience can still feel for them. Like both of those characters, Will is on a quest and the question, among many in the story, is if he’ll maintain his morality along the journey. Sheri: What was your biggest challenge in writing Reverence? Josh: Two things come to mind. First, I wanted Reverence to be relevant beyond just an action story, which is how it started out. Don’t get me wrong, I can enjoy a good action-oriented story, but for me the films and books that stick with me the most are the ones that leave you thinking about the topics they address in their stories. I went through several different versions of the story until I reached a version I was pleased with. The second biggest challenge was editing. It was definitely a trial-and-error process, but I did learn a whole lot. So as painful as it was, I’m grateful for the lessons I learned. Sheri: What is it you hope readers take away from your story? Josh: A whole lot, especially considering the turbulent times we live in. At the heart of the story, I hope readers embrace the idea of constantly questioning your surroundings. Questioning his surroundings is what truly starts Will’s journey. The moment we stop questioning things we become complacent and potentially blind to the true nature of a situation. The characters who “just go with the flow” are victims in their own way, which was the idea of the tragedy behind the character, Luis. Another important aspect of the story I wanted to present is the duality of life, especially in politics. Leaders have the power to bring prosperity to people, but also to destroy lives. This duality is also present in the rebellion movement. Both sides can promise the world and claim righteousness, but both need to be questioned. I didn’t want it to be a matter of ‘good vs. evil’ because while I believe good and evil definitely exist, it is incredibly rare for any matter to be that simplistic. Lastly, I wanted to instill the horror of war. Reverence is not All Quiet on the Western Front, but I didn’t want to make a story where the casualties are thrown aside. When war is waged, no matter the cause, people suffer. Civilian and soldier alike become threatened. In a world like ours that is increasingly dangerous, we need to be very careful about when we choose to engage in war. This something I expand upon in the sequel. Sheri: What can you tell us about your self-publishing experience? Josh: It is both awesome and arduous, but at the finale very rewarding. It takes dedication and a willingness to learn because I learned A LOT myself in 2016. These range from little things like formatting (embarrassing stuff like when to indent and when not to) and big things like pursuing the best cover and book blurbs possible. Everything has to be taken into account before and after publishing your work. To anyone who I may have scared off, let me reassure you: once you get the process down, it’s a lot of fun, and the feeling you get when you progress is indescribable. Josh: Great question, and I think I have an answer that ties into both: Never shy away from help in life, including your writing. Having an outside opinion is key to making your work better, which is ironic considering the ‘do-it-yourself’ nature of self-publishing. Also, the necessity of sticking to your guns on certain things in life, as well as writing. It’s important to edit, but if there’s a scene, piece of dialogue, or character choice you strongly feel is relevant to your book, don’t budge on it. Josh: First, find the right editor because they’ll see things you missed even after you’ve read your book a thousand times. Secondly, be patient. It’s rare for an author to be a hit overnight. Instead of worrying about making it big, focus on writing your next book. The fruits of your labor will shine through as long as you continue to move forward. Josh: I LOVE going to the movies. In fact, no matter how bad the film is, I have never walked out of a film. It’s such an awesome experience to watch a movie on the big screen and to me no amount of speakers and 100-inch TVs can compare. I also like to try new beers and bourbons, so when I have the money I try to visit local breweries. Last but not least, I love a trip to the comic shop. Josh: My God, a whole lot! I've already written a sequel to Reverence which I am very proud of. A preview of it is provided in both print and Kindle editions of my first book, Reverence, and it greatly expands on the world. Readers can expect it to be released around April of this year. I'm also in the works of writing a prequel to the Reverence saga. I can't say much, but what I can say is that you can expect it to be released this year as well. The prequel will focus on familiar characters like Robert Neeson, Captain Halsey, and Chancellor Venloran, but the main focus is on Will’s wife and daughter, Julissa and Zaneta. The story will explore the early stages of the UNR-rebel conflict. Josh: Indeed I do. The site is http://jlanderos5.wixsite.com/joshualanderos, although if you just Google ‘joshua landeros wix’ you’ll find it. I recommend readers check it out since I have a blog on there, a list of all my reviews, and a link to my YouTube account, where I talk movies and more. Sheri: Where can readers purchase Reverence? Josh: Right now, I believe it is exclusively on Amazon, but both print and Kindle versions are available so readers can pick which ever they choose. I myself prefer the feeling of a book in your hands, but I understand Kindle readership is expanding rapidly. Josh: I just want to say thank you for the opportunity to talk with you. It was a lot of fun! As for the readers, read on my friends, and as for the writers, keep on pursuing it. No matter how big or small the idea, see it through to the end. Sheri: Josh, thank you so much for joining us today! I really enjoyed getting to know more about you and your work.